30 minutes and you have this? Well, actually in less than 30 minutes you can make this delicious meal! It was so good. I served it over whole wheat spaghetti, but would be great over rice as well. My almost three year old daughter loved it! In a small bowl, combine cornstarch and broth until smooth. Stir in the soy sauce, hoisin sauce and sesame oil, set aside. In a large nonstick skillet or wok, stir-fry broccoli in canola oil until crisp-tender. Add the garlic, stir-fry for 1-2 minutes. 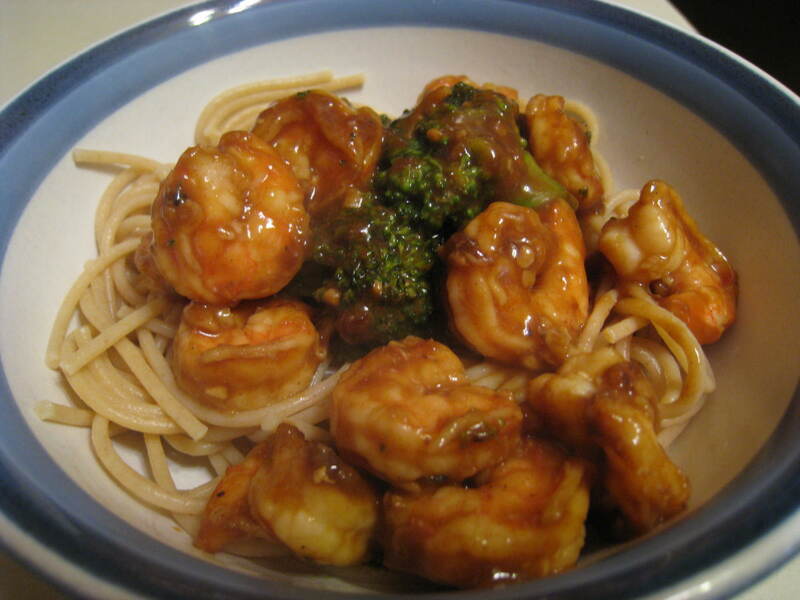 Add shrimp, stir-fry 4-5 minutes longer or until shrimp are pink. Stir in the cornstarch mixture and add to the pan. Bring to a boil, cook and stir for 2 minutes or until thickened.